BTL Exilis Elite uses non-invasive and safe technology to help tighten and re-shape the upper arms. Loose skin can be annoying which is why cosmetic doctors from around the globe are starting to see a marked increase in the number of patients looking to reshape their arms. Brachioplasty (arm lift) and cosmetic surgery is suitable only for a select few (those with excessive arm skin, usually after extreme weight loss). Plus, it is not always necessary to undertake drastic measures to improve the appearance of the arms. There is a non-surgical option in the form of radiofrequency, like BTL Exilis Elite, which helps to tighten skin, reduce fat, reduce cellulite and improve the overall appearance of the skin. Undergoing radiofrequency skin tightening treatment for the arms is pain-free and requires no recovery time – making it both an effective and popular form of non-surgical body contouring. Available across the country, radiofrequency skin tightening treatment can reshape the upper arms and transform skin quality, leaving patients with a smoother contour to the arm’s natural shape. The BTL Exilis Elite skin tightening treatment is a simple procedure, requiring no aesthetic. You’ll be able to return to work or your busy life immediately, as these treatments are able to slot neatly into your routine with minimal fuss. The first step to treating your fatty deposits and loose skin on the arms is to book a consultation with a cosmetic doctor that offers BTL radiofrequency skin tightening treatment. This is your chance to ask any questions you may have about the energy-assisted treatment, and for the practitioner to explain in depth how the treatment can assist you. You’ll be amazed at how simple the radiofrequency skin tightening treatment itself is, and just how different it is to cosmetic surgery – a much more invasive option. During the treatment, and to ensure your comfort, the therapist will prepare the treatment area by applying a conducting gel to the arm/s before the device is moved across the area. Heat energy is transmitted via the device head, so you can expect a pleasant and comfortable warming sensation. Each radiofrequency skin tightening treatment is tailored to the individual, so your treatment time will vary depending on the concern you have expressed. On average, treatment times range between 30-60 minutes, and most patients are offered a course of 4-6 radiofrequency treatments to achieve the best results. You may see initial results from your first treatment, although, in most cases, the full result will be visible 3-4 months post-treatment. If you’re looking to get your arms in shape, now is the time to book your radiofrequency skin tightening treatment. Sculpting the upper arm area has never been easier or more in demand. Radiofrequency skin tightening treatments can also help to reduce skin laxity on the face in areas such as the jaw and neck, and can even improve collagen production, which leaves skin looking and feeling firmer and plumper. It is this combination of firming and toning that makes BTL Exilis Elite one of the most popular non-invasive body contouring options for patients. Founded in 1993, BTL Industries is a privately-owned developer and manufacturer of medical and aesthetic equipment. BTL currently has over 900 employees and direct offices in more than 51 countries. BTL Aesthetics, a division of BTL, has revolutionised the means to non-invasively remove adipose tissue and currently ranks 2nd amongst the non-invasive body shaping and tightening manufacturers globally. 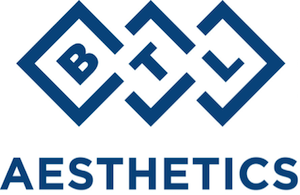 BTL Aesthetics’ brands include: BTL Exilis, BTL Vanquish, BTL Intima, BTL Exilite, BTL X-Wave and BTL Lymphastim. These treatments are available across South Africa at selected medical aesthetic centres and salons. Contact BTL below to find a clinic near you.